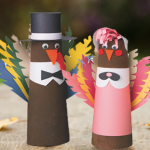 Looking for some fun new crafts and decorations to help you with your Fall and Thanksgiving celebrations? Check out our top 10 DIY crafts that you can keep up all season long! Our Craft Stick Wreath can be easily turned into a Fall and Thanksgiving themed activity! This simple wreath is made with regular and jumbo craft sticks that are colored with markers and water to give a blended look. Then simply glue the craft sticks to the included wreath shape. Everything you need to make the wreath is included in the kit. If you want to get even more creative like we did, add a festive message using jute string, oak tag, and the markers which are included in the kit. We also thought it would be fun to have some of our wood leaves hanging in the center. Who doesn’t love eating pie for Thanksgiving? Make a festive pie garland to hang up as a decoration for your Thanksgiving events. These Kraft Paper Pennants work great because they are made from heavy paper, the perfect pie shape, pre-punched holes, and the color makes it easier to decorate. Pecan Pie: Use the broad side of a brown crayon to shade the craft paper a darker brown. Draw the pecan shapes with a brown permanent marker. Glue a cotton ball to the center for the whipped cream! Apple Pie: Cut thin strips of tan construction paper and glue them in a criss cross pattern to look like pie crust over apples. Cherry Pie: Cut a piece of red construction paper in the shape of the kraft paper (trace it for accuracy). Glue to the kraft paper. Then cut thin strips of tan construction paper and glue them in a criss cross pattern to look like pie crust over cherries. Pumpkin Pie: Use the broad side of an orange crayon to color the kraft paper. This gives it a shaded look. Glue a cotton ball to the center for the whipped cream. The perfect fall season accessory! 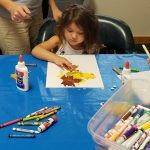 This makes a fun fall craft for kids age. The wood leaf necklace kit comes with 12 projects total, and includes the wood leaves with holes in the stems for stringing, wood beads, hemp cord and markers. For the yellow and red leaves, we used a brown/dark green marker and lightly drew a few lines in the center for the stem. Remember, the marker will bleed a bit since you are coloring on wood. Then string the cord through to make the necklace. For the beads, have fun mixing and matching the number of wooden beads and the colors to match the leaves. Tip: Coloring the small wood beads is fun, but messy. You will get marker on your fingers, so just be sure to wash your hands with soap and water after. Add some jewelry making to your activity calendar this fall! Our wooden bead assortment is perfect because it has brown, orange, and red. You can also add a pop of color with our other wooden jewelry bead mix that includes fuchsia. Get creative with different patterns – each bracelet or necklace will look unique! 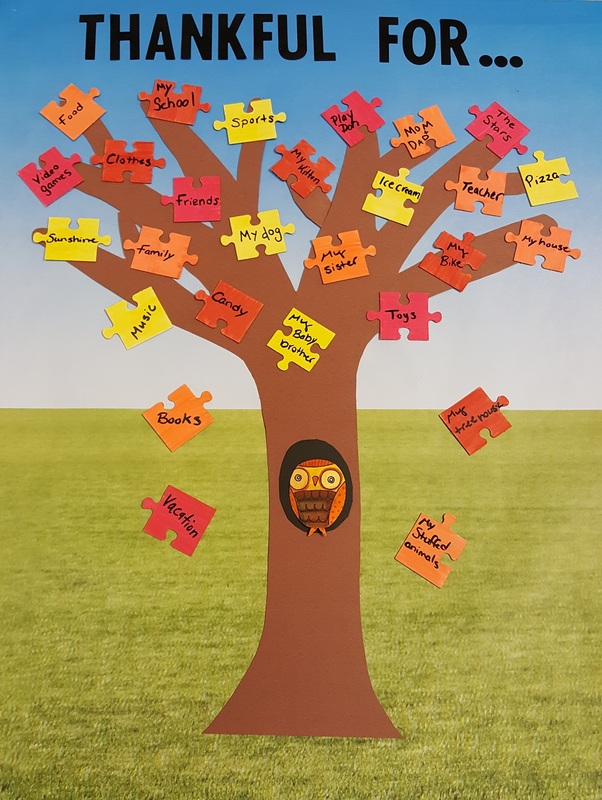 This puzzle tree is a great collaborative Thanksgiving craft activity for the classroom! 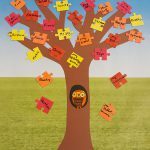 Students can share what they are most thankful for this year by coloring puzzle pieces and writing a few words on each. View the step by step instructions here. These wooden cubes are super cute to use for words or sayings for Fall and Thanksgiving! We painted each block either yellow, orange, or brown using acrylic paint. After it dried, we painted the letters for “Give Thanks” in white acrylic paint. 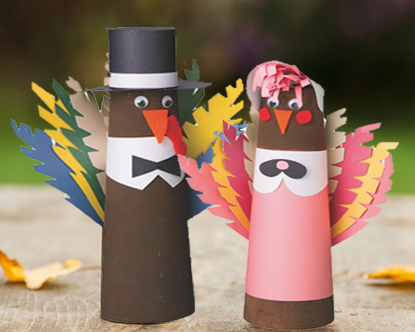 Then, you can make an adorable turkey to go on the top. Glue them all together then display it for a seasonal decoration! Turkey Block: Paint the block with brown acrylic paint. Cut out a beak with yellow sticky foam. Use red felt for the snood (the part that hangs over the beak). Draw the eyes with a black permanent marker or paint. Add fall colored mini feathers to the back and glue them! Tree: Cut out the shape of a tree in black felt and glue it to the tan felt background. The black color gives a silhouette look. Glue an assortment of fall colored craft buttons to the branches and around them. This was our favorite! Pumpkin: Cut out pieces of black felt or black paper for the nose and mouth and glue them onto the orange felt background. Add wiggly eyes! Owl: Use light brown felt to make the wings, then yellow, white, and dark brown for the eye area, orange for the beak, and add 2 buttons for the eyeballs. Glue to the brown felt background. We love how this wood leaves craft kit can be used to make so many different fall decorations! Follow the included guide to make the leaf ornaments, or you can branch out to make hanging leaf decorations like these! We colored the leaves with the included markers, then strung them on jute string. You can also use the leaves as stencils for other craft projects! The kit comes with 48 leaves, 12 each of 4 different leaf shapes. Who knew you could turn doll pins into any character? Make an adorable turkey, cat, and even a Halloween themed Frankenstein and Dracula. Use acrylic paint and a small painbrush. For the small features, you can use fine tip permanent markers. Don’t forget to glue mini feathers to the back for the turkey! Our sand art candles kit is one of my favorite craft kits. You can make themed sand art candles for all seasons and holidays. The kit includes glasses, votive candles, dowels, and 6 bags of fine sand. The colors include orange, red, yellow, green, and blue. We made 3 different designs. After you pour your sand in, add the candle to the top. You may have to push and turn the candle a few times so it goes into the sand far enough. Three layers & colors: Pour equal amounts of each color on top of each other, making 3 layers. Place the candle in the center. Six layers with design: Pour equal amounts of each color on top of each other, this time using less of each so you can make six layers instead of three. Use the included wooden dowel to create designs down the side. 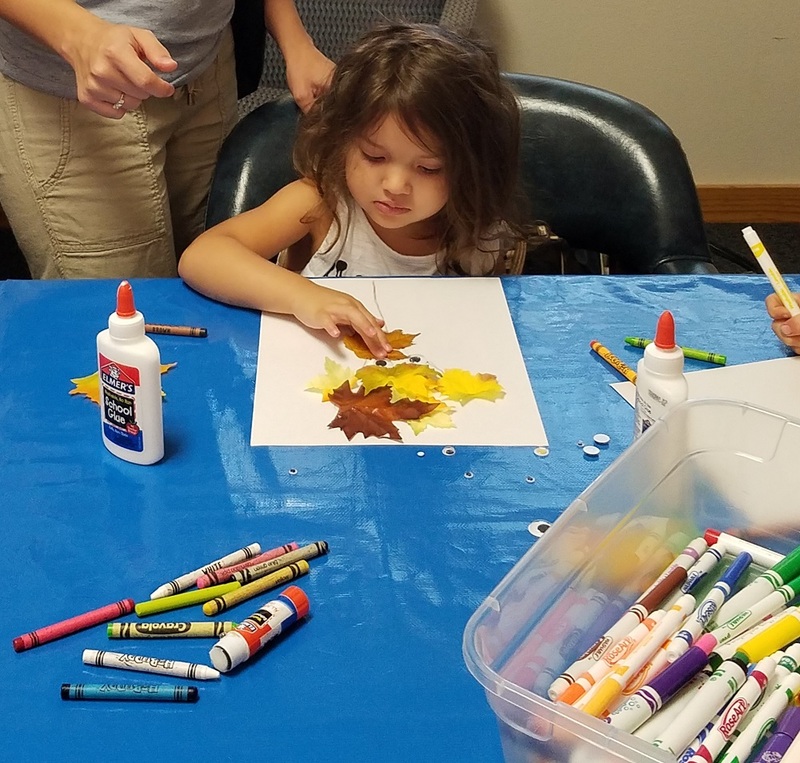 Blended colors: Have fun mixing sand colors to get some different fall colors! We mixed yellow and orange, and orange and red. This entry was posted in Arts & Crafts, Fall, Fall Crafts, Holiday Crafts and tagged autumn, autumn crafts, diy crafts, fall, fall crafts, fall decorations, give thanks, Kids Crafts, leaves, owl, seasonal crafts, thanksgiving, thanksgiving crafts, thanksgiving decorations, turkey by S&S Worldwide. Bookmark the permalink. All of the ideas are great! I think I will have the children decide on which of the ones you presented, they would like to make! Thanks! Great ideas! I will use the leaf necklace. Hi Susan! Thanks for subscribing to our blog, and that is so great to hear you will be using some of these ideas for your program. Feel free to share photos and let us know how it went!